The Senate has approved a measure that prohibits local and state government agencies from contracting with abortion providers and their affiliates. Editor's note: This story has been updated to note that the Texas Senate gave final approval to Senate Bill 4. 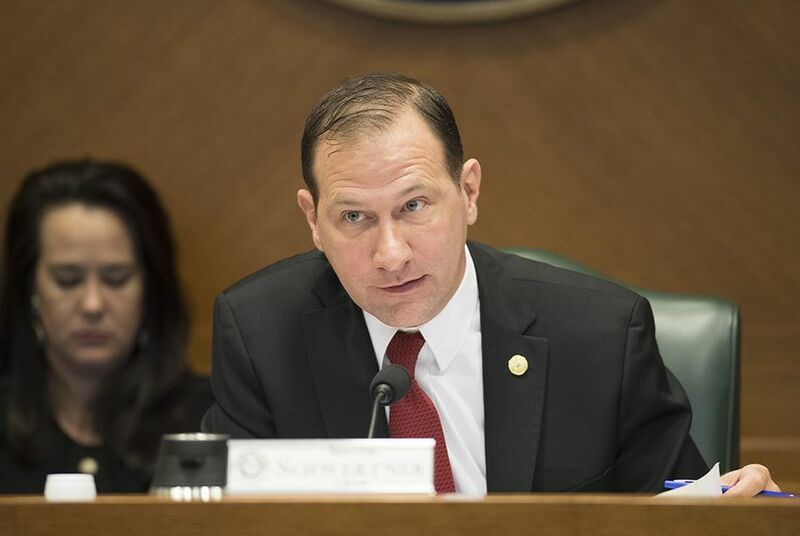 The Texas Senate gaveled in around 10 a.m. Tuesday, but it wasn't until past midnight that lawmakers turned their attention to Senate Bill 4, an anti-abortion measure that was initially approved over objections from Democrats. "Should our tax dollars ... fund the culture of death that the abortion industry promotes?" state Sen. Don Huffines, R-Dallas, asked during a discussion of the bill. State and federal law already prohibit tax dollars from paying for abortions, but SB 4 by state Sen. Charles Schwertner, R-Georgetown, would broaden that ban to include any financial contracts — such as lease agreements — with clinics that are affiliated with abortion providers but don't actually perform abortions. Such clinics provide other health care like HIV and family planning services, and breast and cervical cancer screenings. And Democratic lawmakers repeatedly said early Tuesday that the bill, if passed, could negatively impact access to these health services and other preventive care. Senators acknowledged during a Friday hearing that the only abortion provider in the state affected by the bill would be Planned Parenthood, which performs abortions at surgical centers separate from their clinics that offer standard reproductive health care. According to the organization’s latest report, abortions made up 3 percent of its services in 2015. Just a week into the 30-day special legislative session, the Senate has now passed several bills addressing abortion-related topics Gov. Greg Abbott placed on his 20-item agenda. The House still has not debated its own versions of the abortion legislation, though lawmakers in that chamber began hearings on the bills this week. On Monday, the Senate voted out two other anti-abortion measures that would require physicians and facilities to report more details about abortions — and fine those who do not comply. The two bills, SB 10 and SB 73, were given final approval around midnight Wednesday and now head across the hall to the House. Under state Sen. Donna Campbell’s SB 10, in procedures where complications occur, physicians would be required to submit reports to the state health commission that include information like the patient’s birth year, race, marital status, the date of her last menstrual cycle, the number of previous abortions and the number of previous live births. Physicians who failed to comply with the reporting requirements within 72 hours would face a $500 fine for each day of the violation. During a hearing on the bill Friday, reproductive rights groups said the requirements would violate the privacy rights of doctors and patients. “Collecting this data is important to guarantee best medical practices,” said Campbell, a New Braunfels Republican, adding that the state needed to “cast a wider net” in gathering data. The reporting requirements in SB 73, from state Sen. Bryan Hughes, R-Mineola, would include whether minors seeking abortions did so because of a medical emergency, and whether they obtained parental consent or a judicial bypass. Hughes said Monday his bill was about making sure "little girls who are in this terrifying situation are looked out for and given all of their options." During a hearing on the bill Friday, Susan Hays, an appellate lawyer who handles judicial bypass cases, said the law already required clinics performing abortions on minors to report to the state.